UDM Downloads > Hot Checkers! Play four kinds of checkers against the computer or human opponent. 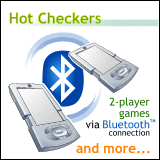 Two player game can be played via Bluetooth or infrared, or locally, using your handheld as a game board. Hot Checkers features strong AI with five adjustable difficulty levels (from Novice to Expert) and supports four versions of this classic board game: American Checkers, Pool, Russian Checkers and Giveaway. This game works on all popular Palm OS devices. Palm OS 5 compatible.